To build a streamlined marketplace of activity vendors, restaurants and other St. John service providers so that visitors may browse, inquire and book their activities online, in advance and all in one place. Read the Case Study I wrote about this project here. The home page layout is simple: several full-width photographs separated by white space and simple copy. The photos display the many beautiful sides of St. John with overlaid buttons navigating to different areas of the site. We call this our Services page. Like the Home Page, it includes a hero-style header, but this one includes three action options. The copy persuades travelers to book their activities early so that they can truly relax and be inspired on vacation. It also explains – in the least amount of words possible – how the Paradise Found website works and how it can help them. The Category pages took the most time to style because I had to figure out how to make the menu grid of photos resize dynamically depending on number, AND make all the photos of various qualities and sources look good together. I describe the problem and solution in copious detail here in the Case Study I wrote. 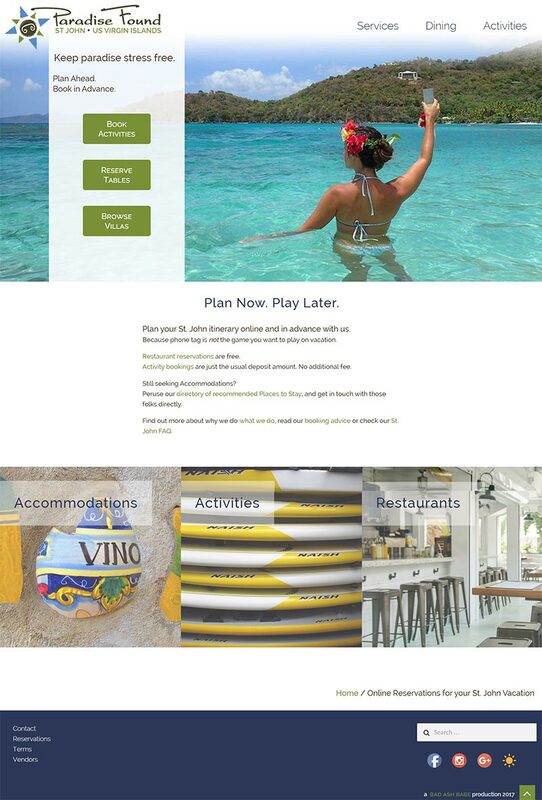 Every restaurant, accommodation partner and bookable activity has its own product page. Bookable activities and restaurants that take reservations also have a booking calendar on this page. It took quite a bit of styling to differentiate the page from the WooCommerce default style. 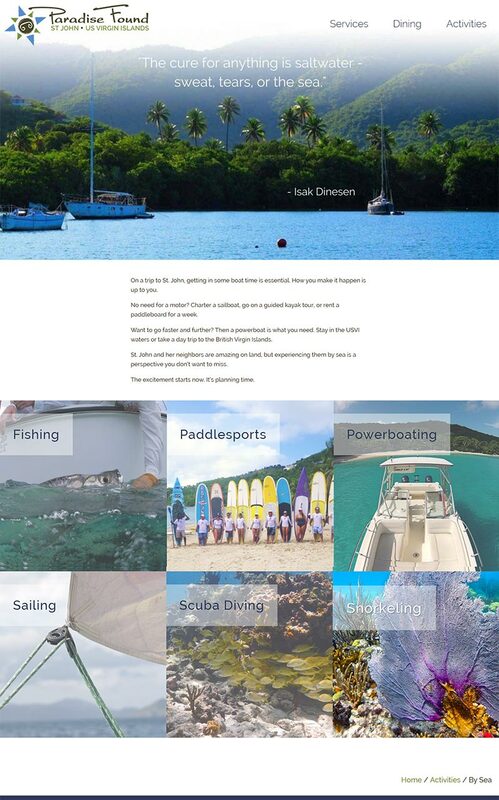 This landing page is where we send St. John vendors to quickly and easily explain what Paradise Found St. John is about with links to a sign-up form specifically for their type of business. It was a challenge to describe (in as few words as possible) how the different players convene to make Paradise Found work. I also needed to design the page so that it is engaging and easy to read. Well. That’s the Paradise Found, St. John site in a clam shell! I wrote a 2500 word Case Study about this project, if you’re hungry for more.